Colleen Hoover needs to stop writing. Yep - I said it BUT for the love of all that is reading, put the freaking pitchforks away and listen to the why. I'm a nice person. I really am. 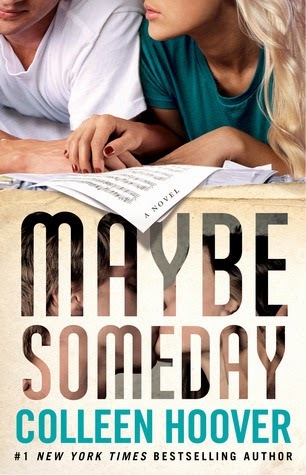 But I feel awful when I tell someone that Maybe Someday is my new favourite CoHo book. Just awful. Mean. Like I'm some horrible person who fell out of love with everything else she wrote. BUT I DIDN'T. I hate myself for even thinking it, because it feels like I'm somehow saying that all her other books are inferior. I swear on all my books that I still LOVE every one of her words (even her Facebook posts), but Maybe Someday is *sigh* the best of the best. It's like buying a banana split and then finding out it's free. It's finding out that a 1 kg bag of Cadbury Mini-Eggs is on sale at Costco. It's like being able to do nothing but read for the rest of your living days. I finished this book about 2 weeks ago. At first, I was like 'well, that was good'. Three hours later I was like 'well, okay, it was so much better than good! ', and 6 hours after that, I was ready to declare my undying love to it. It's kind of funny that my love for this story snuck up on me. But when it hit me full force a week later, it was almost immobilizing. I couldn't wrap my head around it. I wasn't expecting it to still pummel me full-force. The subtle surprises and the painstaking fall constantly replaying in my head in 1080p. So I randomly laugh, gasp, and cry. I hate hating myself for loving Maybe Someday more, and I just can't fathom what will happen with the next book she writes. I guess total heart annihilation ain't that bad when you consider that it'll be to a Colleen Hoover book.